Support is available for people seeking options beyond the 12 steps, and proponents believe recognition will grow with future generations’ exposure to different approaches. People trying to overcome addiction have a variety of experiences in treatment. They may receive outpatient, intensive outpatient, or residential treatment. They may access services in luxurious surroundings, community clinics, or prisons. They may encounter cognitive behavioral therapy, motivational interviewing, or family therapy. Despite these differences, there is something that many people in recovery will share as they progress through and out of treatment: They will be asked, if not required, to “work the steps.” Indeed, the process of recovery from addiction has been dominated in the United States by the 12-step method established with the founding of Alcoholics Anonymous (AA) in 1935. But AA and its various successors are not the only mutual-aid groups available to support people in recovery. For the past few decades, several other groups have tried to offer alternatives to those who want something other than a 12-step approach. 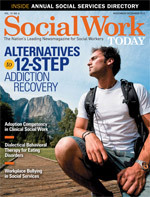 These alternative groups historically have struggled to gain a significant following, but with the advent of new technologies and the rise of a new generation of people in treatment who want more control over their recovery, these groups believe the time has come for social workers and other behavioral health professionals to accept them as part of the mainstream continuum of recovery services. LifeRing is one of five organizations often cited as the largest national groups that provide an alternative approach to the 12 steps, according to the Substance Abuse and Mental Health Services Administration. The others are SMART Recovery, SOS (Secular Organizations for Sobriety/Save Our Selves), Women for Sobriety, and Moderation Management. Representatives of these organizations stress that it is not their goal to bash 12-step programs, and they acknowledge that such programs have helped countless people, including many who use the 12 steps to supplement their involvement with alternative organizations. • Secularity: The 12 steps as originally outlined by AA are overtly spiritual, with references to “a power greater than ourselves,” God, and prayer. Other 12-step groups have retained the same or similar language. The alternative groups, on the other hand, promote themselves as secular in nature. A secular approach makes the groups more open and comfortable not only to atheists and agnostics but also to Buddhists, Muslims, and others who do not share a Western, Christian tradition, Stump says. The alternative groups are not antireligion, however, and many of their members belong to a religious denomination or identify as spiritual. The alternative groups are not monolithic, however, and there are individual differences among the groups. For example, Moderation Management promotes a harm-reduction approach to alcohol use, while the other four groups are abstinence based. And the five groups mentioned above do not encompass every alternative to 12-step programs. For instance, many groups exist that provide services to people in recovery who want more religious-based support services than 12-step programs typically provide. These groups include The Calix Society, which is designed for Catholics in recovery, and Jewish Alcoholics, Chemically Dependent Persons, and Significant Others (JACS). But why? In a consumer-driven society where people have countless choices with everything from what brand of yogurt they buy to what kind of car they drive, why does the 12-step approach remain dominant in recovery services? There’s no simple answer, and observers point to several theories to explain why alternative mutual-aid groups have not been able to catch on. One factor is history. AA was established more than 40 years before any of the major alternative groups. When AA was established, there were few treatment options available for alcoholics, so the organization filled a void, says Susan Foster, MSW, vice president and director of policy research and analysis for CASAColumbia, a New York-based research organization that assesses the impact of substance use on American systems and populations. “[AA] was the only resource available for people with addictions to alcohol, and it was life-saving and critical to many people,” she says. Another factor is how treatment services in the United States evolved after the formation of AA, according to Katherine van Wormer, PhD, MSSW, a professor in the University of Northern Iowa department of social work. Central to this evolution is the development of the “Minnesota Model” of treatment services, which focused on a 12-step approach, an insistence on abstinence, and emphasis on having trained recovering addicts joining professional staff as part of the treatment team (Anderson, McGovern, & DuPont, 1999). Eventually adopted by Hazelden, one of the best-known treatment providers in the country, the Minnesota Model became the one that was widely adopted across the United States. In a recent article in the Journal of Groups in Addiction & Recovery, Kelly and White (2012) discuss other possible reasons for the dominance of 12-step groups, particularly AA. Among them is that AA’s lack of a highly centralized governing structure makes it relatively easy for anyone in recovery to start an AA meeting, whereas some of the alternative groups have a harder time establishing meetings because these organizations are stricter in their requirements regarding who can facilitate meetings. In addition, AA’s promotion of a spiritual approach to addiction recovery may be an especially good fit for the traditional view of the United States as a country built on religious values. Finally, the authors describe a catch-22 situation in which treatment professionals are more likely to refer clients to AA because its popularity means that more meetings are accessible and that there is more research on its effectiveness. These referrals further cement AA’s dominance and keep alternative groups on the margins. There are signs that alternative mutual-aid groups are becoming more visible in the recovery community. One indication is that technology has given such groups new opportunities for outreach. Several of the alternative groups have an online presence through online chat rooms and message boards, Facebook pages, and Twitter feeds. Some groups even run online meetings. Online interaction not only engages recovering addicts who cannot make it to meetings because of geography but also those people in recovery who feel more comfortable interacting technologically than attending meetings in person, Saarela says. Alternative groups also have made renewed attempts to engage treatment service providers. For example, Women for Sobriety, SMART Recovery, SOS, and LifeRing worked together to create materials to educate providers of employee assistance program services, Makey says. Anderson, D. J., McGovern, J. P., & DuPont, R. L. (1999). The origins of the Minnesota model of addiction treatment: A first person account. Journal of Addictive Diseases, 18(1), 107-114. Kelly, J. F., & White, W. L. (2012). Broadening the base of addiction mutual-help organizations. Journal of Groups in Addiction & Recovery, 7(2-4), 82-101.